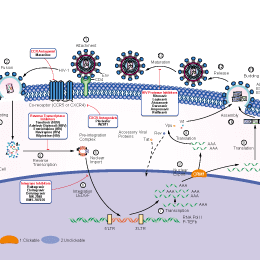 Tenofovir blocks reverse transcriptase and hepatitis B virus infections. Tenofovir Disoproxil Fumarate belongs to a class of antiretroviral drugs, it inhibits the activity of HIV reverse transcriptase by competing with the natural substrate deoxyadenosine 5’-triphosphate and, after incorporation into DNA, by DNA chain termination. Emtricitabine (FTC) is a new nucleoside agent that has activity against both human immunodeficiency virus (HIV) and hepatitis B virus. It is a reverse transcriptase inhibitor. Intracellular half-life is 39 h.
Adefovir Dipivoxil is a reverse transcriptase inhibitor, used in the treatment of chronic hepatitis B virus (HBV). Nevirapine is a non-nucleoside reverse transcriptase inhibitor (NNRTI) used to treat HIV-1 infection and AIDS. Didanosine is a reverse transcriptase inhibitor with an IC50 of 0.49 μM. Lamivudine is a potent nucleoside analog reverse transcriptase inhibitor, used for treatment of chronic HBV and HIV/AIDS. It works by blocking the HIV reverse transcriptase and hepatitis B virus polymerase. Stavudine (d4T) is a nucleoside analog reverse transcriptase inhibitor (NARTI) active against HIV. Telbivudine is a potent, and selective HBV reverse transcriptase inhibitor, used to treat HBV infection. Zidovudine (ZDV) is a nucleoside analogue reverse transcriptase inhibitor, used to treat HIV. Zalcitabine is a nucleoside analog HIV reverse transcriptase inhibitor (NARTI). Abacavir is a commonly used nucleoside analogue with potent antiviral activity against HIV-1. Foscarnet Sodium inhibits viral RNA polymerases, reverse transcriptase, and DNA polymerases through noncompetitive inhibition with dNTPs. Salicylanilides are a group of compounds with a wide range of biological activities including antiviral potency, antibacterial (including antimycobacterial) and antifungal activities. Efavirenz is a synthetic non-nucleoside reverse transcriptase (RT) inhibitor with antiviral activity. Fangchinoline, a bisbenzylisoquinoline alkaloid, is a novel HIV-1 inhibitor with pain-relieving, blood pressure-depressing, and antibiotic activities. Tenofovir Alafenamide (GS-7340) is a prodrug of tenofovir, which is a reverse transcriptase inhibitor, used to treat HIV and Hepatitis B.